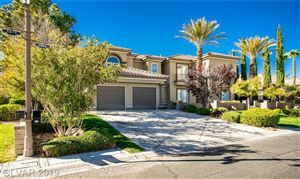 Canyon Gate is a beautiful guard-gated community located on Las Vegas' west side at the intersection of Sahara and Durango. The community is comprised of 320 acres and has 500 homes starting at around $500,000 to over $5,000,000. Resident's enjoy the member's only Canyon Gate Country Club, a community pool, tennis courts and a fitness center. Aside from the beautiful golf course, Canyon Gate distinguishes itself by the numerous and beautiful waterfalls throughout the community. And speaking of golf, Canyon Gate's 18 hole course, designed by Ted Robinson, offers spectacular views and challenges for all play levels, from amateur to advanced. Canyon Gate homes were designed to offer residents private backyards with spas and pools. Built in the 90's, the homes are spacious and well appointed, offering some of the best residences in the Valley. The Foster Beckman Group can help you find a home for sale in Canyon Gate Country Club! Our team of Las Vegas Real Estate Agents and home specialists at Foster Beckman Group are available to help you buy, sell or invest in Canyon Gate Country Club property. Call us today at 702-686-2695 to see how we can help you with all of your real estate needs!